This morning it was announced that possibly the first phase of Carl Icahn exiting his entire Herbalife position had begun. I had previously speculated that it would take a multipronged approach for Mr. Icahn to exit his full position in the company, as he holds such an enormous amount of shares. Even after tendering up to 11.4 million shares, he noted this morning, he could still hold over 30 million more shares. Very importantly, his note about tendering this morning says nothing about holding on to the rest of his position or not selling his remaining shares. This could have other big holders thinking that a race to the exits could soon be on. As I discussed on a podcast that I did just last week with Matt Stewart, trying to figure out how he would exit, we both guessed that Mr. Icahn may actually be able to blow out some of the shares on the open market as well, seeing as how he has made such a tremendous profit on his initial investment. More than just being a headline of “Mr. Icahn exiting” this represents a major changing of the guard at Herbalife. Mr. Icahn’s once tightly held shares may wind up hitting the open market at some point relatively soon (though obviously not the ones that he tendered, which go to treasury) and his taking the initiative to begin to sell may act as a cue to other sellers that the jig is up at the company. With the old executive staff, including CEO Michael Johnson and CFO John DeSimone now primarily out of their roles , Bill Ackman out of the trade, the short “story” over and everything returning to “normalcy” (for as normal things can be for an MLM company), Herbalife may actually once again wind up being valued on the merits of its underlying business, which needless to say are poor. Don’t let the “low” $50 stock price fool you. 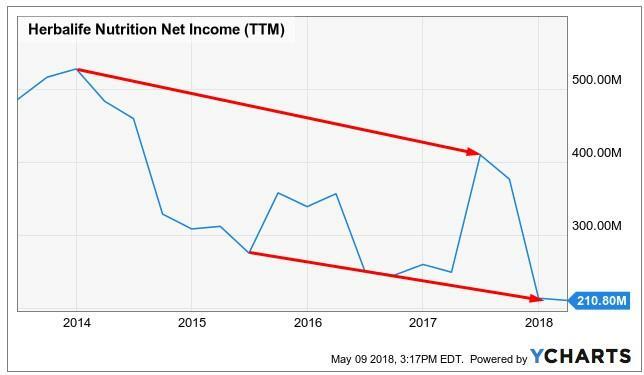 Even if Herbalife shares were to move back to about $35, it still would’ve been about $70 pre-split and that would be a PE of about 12x, assuming they can hit estimates for next year – which I believe they absolutely will not do. I think that Mr. Icahn tendering could trigger a race to the exit and shares moving significantly lower in very short order. 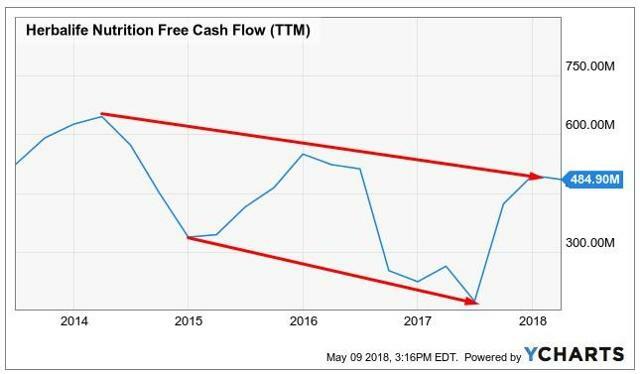 As I recently just said in this article, this is not a growth story and the underlying fundamentals of this company are not good enough to support the ridiculous valuation of over 35x GAAP earnings that the company currently holds. 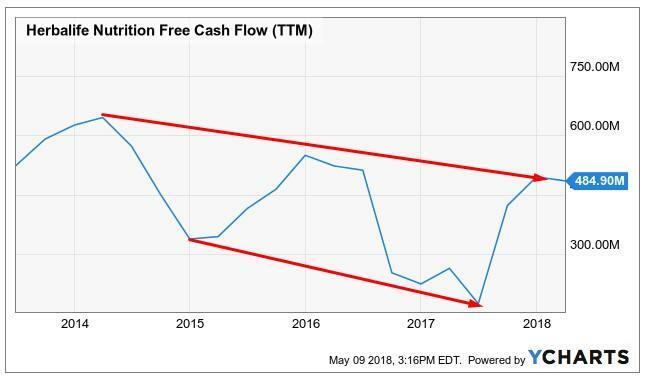 I expect that shares will fall significantly as major holders realize the same unfortunate truth about the company’s organic business that many skeptics have realized over the last couple of months: free cash flow and net income are trending lower. With Mr. Icahn leading the charge, the race to the exits will likely be on soon. I predict shares move back down to $35 in extremely short order.